My husband made these projects in his Ceramics Class when he was about eleven years old. Well, he did not make the products itself but he painted them. There are some imperfection on the paint but his parents kept it in great condition and now we have it at home. The kids were excited when their Dad told them that he made these when he was a kid. By the way, check out this awesome giveaway. 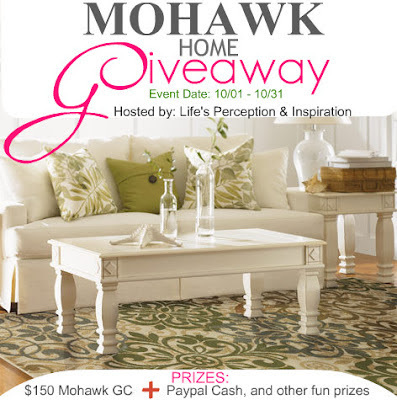 Prizes: Area Rug of your choice worth $150 Giftcard form MOHAWK (US Only), Paypal Cash and other FUN prizes (worldwide)! Such a pretty vase and what a clever boy he was! Thank you for sharing it on Mandarin Orange Monday. Eleven!! I'm impressed I bet you are keeping your children's treasures just as his parents kept these. Love the vase. Have a fabulous week. Thanks for the visit. Please leave only one link next time. Love the vase! My blues are here and here. Please leave only one link next time. What a beautiful vase and saucer. I used to own a ceramics store, so I appreciate the beauty of this. Thank you so much for sharing. He sure did a super job on the rooster! True treasures for children and grandchildren to come! Your vase and flowers are very pretty! Happy Blue Monday! Your husband made it at eleven years old? Wow! Goodness I am impressed that he was just eleven when he made that beautiful jug. Impressive. I love the vase. Happy RT2. Your husband could have been an artist! Thanks for showing! It's so beautiful. Wil. ABC Team. Children are amazing given a chance. This is a treasure for sure, and very pretty. What a fabulous memory to have around the house! I remember painting ceramics, but I don't think any of them have survived the decades. These are very nicely done! putting flowers inside makes this pitcher outstanding. wow, john did that? how amazing for an 11 year-old boy...really cute!